This layout is up on the Little Yellow Bicycle blog today. It's part of a feature on the Winterings Paper Crafting Kit. This kit is filled with all sorts of snowflakes, some with doily designs (my favorite) and some with "traditional" snowflakes. In addition to the pleated and circular elements there are also diecut snowflakes in the package. So pretty! As you can see, I used a mix of pleated and round pieces to create a border across my page. Some of the round snowflakes are layered to add dimension. I also used a circle to create a pull for my journaling tag. Do you see the blue scalloped border up in the top right corner? That's one of the pleated flowers (not pleated, of course). This is BEAUTIFUL!!! I loveeeeeeeeee the colors, the circles and the rosettes!!!! This is so so pretty, Lisa. Love the border you created! This is beautiful! I love those rosettes!!! OH WOWOWOWOWOW!!!! This is stunning and my all time favorite page that you have created. This is soo very pretty, Lisa! Lovely, lovely page! The 'florets' are so great! Love that they come scored for you in the package! Wow...this is a truly gorgeous page! Those paper are so soft and pretty! Love the LO Lisa! Your embellies are amazing! I love these blue and brown colours. love this one too!! The colors together are amazing and your design is Perfect!!! 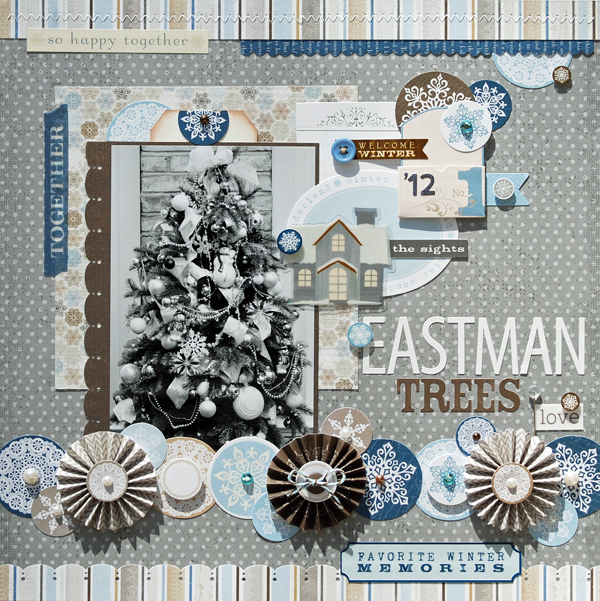 Just found this through Paper Issues - absolutely gorgeous and pinned for future inspiration! Wow!